Environmental activist group Kalikasan People’s Network for the Environment (Kalikasan PNE), Palawan Alliance for Clean Energy (PACE) joined progressive lawmakers yesterday in filing House Resolution No. MAKATI—Indigenous peoples from KATRIBU Kalipunan ng mga Katutubong Mamamayan ng Pilipinas along with environment activists conducted a protest action at the office of D.M. Consunji, Inc (DMCI) on Friday, June 5, on the commemoration of the World Environment Day. National environmental group Kalikasan People’s Network for the Environment (Kalikasan PNE) denounced the Palawan Council for Sustainable Development (PCSD) and the DM Consunji Inc. (DMCI) in their railroading of the Strategic Environmental Plan clearance of the company’s coal-fired power plant project in Narra, Palawan. COTABATO CITY, Philippines — Indigenous peoples’ and human rights groups have mounted a fact-finding mission to investigate the disappearance of a Manobo activist who was last seen in the company of militiamen guarding a private firm’s compound in the hinterlands of Lebak town, Sultant Kudarat. An officer of organization Kisasabanay Dulangan Manobo (KIDUMA) was invited inside the Consunji compound in Brgy. PAGADIAN CITY, Philippines – Citing the need to protect the environment, a regional trial court here on Friday ordered the Canadian mining company TVI Resources to halt its road construction project and similar activities in Bayog, Zamboanga del Sur. Records of the case show that local residents had accused TVI of destroying naturally grown trees and rubber trees in the construction of a road that would connect the villages of Dipili, Pulang Bato and Depore. KORONADAL City, —-Indigenous peoples and advocates have criticized the government’s seeming indifference on the plight of the T’bolis in Barangay Ned, Lake Sebu. MANILA —- Aeta leader Nelson Mallari seemed to have unending stories on the plight of indigenous peoples in Central Luzon. 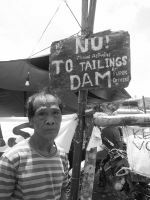 “Mining, military reservation and dam constructions dislocate indigenous peoples in the region,” Mallari, chairman of the Central Luzon Aeta Association (CLAA) and secretary-general of Katribu party list, told Bulatlat in Filipino. CLAA’s members include Aeta with six sub-tribes, Dumagats, Ilongots and Agta in Pampanga, Tarlac, Aurora and Zambales. “Places we consider sacred are now up for grabs by mining companies,” Mallari said.